Intel and SMS Audio have teamed up for a pair of earbuds that monitor the user's heart rate, but the most interesting feature actually lies in the headphone jack. 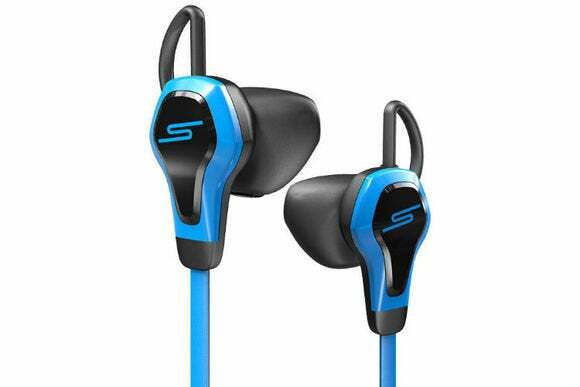 The SMS Audio BioSport measures heart rate through the user's ear canal, and feeds the data into third-party smartphone apps such as RunKeeper. Intel says the “ear-wing” design sits deep in the ear canal, continuously measuring heart rate and filtering out other types of noise. While the BioSport isn't the first set of earbuds to measure heart rate, it's unique for its ability to draw power from the headphone jack of an iPhone or certain Android phones. Jabra's Sport Pulse Wireless earbuds rely on a Bluetooth connection, and must be charged periodically with a MicroUSB cable. There are pros and cons to both approaches. Jabra's Bluetooth connection means you don't have wires dangling to your arm or pocket, and it also allows connectivity to any recent iPhone or Android device. Intel and SMS say their earbuds work with the iPhone 4S or higher, but only five Android phones are supported for now. If you don't have a Samsung Galaxy Note II, Samsung Galaxy Grand II Duos, Samsung Galaxy S4, Samsung Galaxy S5, LG Nexus 5 or Motorola Moto X, you're out of luck. Having one device fewer to charge is always nice, and being able to feed the data into third-party fitness apps is especially useful. But that brings up another caveat: Support for other apps besides RunKeeper won't land until next year, and it's unclear what those apps will be. SMS Audio is taking orders now for $150. The story behind the story: For Intel, this is one of the first actual products to spring forth from its newfound wearable efforts, alongside the recently launched MICA fashion band for women. The chipmaker will also reportedly power the next version of Google Glass, and it's teamed up with luxury eyewear brand Luxottica for additional smartglass research. Intel has also shown off a shirt that gathers biometric data, but no product has come from it. Intel was late to phones and tablets and is still struggling to gain its footing. It's trying to jump on wearables early to avoid making the same mistake twice.